I actually like to make this dish in winter, when I crave a little colour on my plate. The pepper salsa replaces a tomato salsa, which in winter is hard to make taste like it’s summertime ripe-tomato partner. 1. For the salsa, finely dice the roasted red peppers and toss them with the cucumber, red onion, rice wine vinegar, sugar and a little salt and pepper. Cover and chill for 30 minutes. Drain off any excess liquid and stir in the coriander, mint and sesame oil. Season to taste and chill until ready to serve. 1. For the salmon, preheat the oven to 400°F. Heat a large, oven-proof sauté pan over medium-high heat and add the olive oil. Pour the sesame seeds onto a plate and season lightly, stirring to mix. 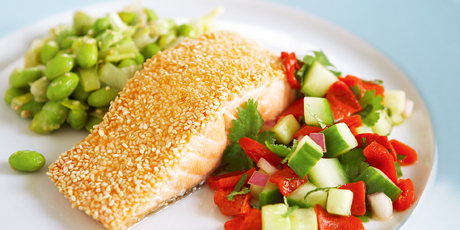 Dip the top of each salmon portion into sesame seeds and place, sesame seed-side down into hot pan. Cook for 2 minutes, then flip salmon portions over. Place the pan in the oven and cook for 10 to 15 minutes (10 for medium, 15 for well done). Serve this with the salsa on the side.